Israeli forces opened fire on dozens of protesters marching on the eastern border of the Gaza Strip near Khan Younis on Sunday. Witnesses said that Israeli forces opened fired on the protesters as they neared the border, adding that no injuries were reported. Ma'an reports that the protest was called in opposition to the Israeli-administered blockade of the coastal strip as well as to delays in reconstruction. Protesters were also commemorating the 39th Palestinian "Land Day." Adham Abu Salima, spokesman for a local activist group, the National Committee for Breaking the Siege and Reconstruction, told Ma'an the protest had been called to mark "refusal" of the blockade and to stand up for Gazan families whose homes are in ruins. Large swathes of the Gaza Strip remain in ruin following a 50-day Israeli assault last summer, which killed more than 2,300 Gazans and left 100,000 homeless. However, reconstruction has been slow due to the restriction on imports the Israeli authorities impose as part of the blockade, which has been in place since 2007. Israeli forces have repeatedly opened fire on Palestinian civilians near the border since the ceasefire agreement signed Aug. 26, 2014. In February alone, there were a total of 26 incidents of shootings, incursions into the Strip, and arrests, according to the Palestinian Center for Human Rights. The attacks come despite Israeli promises at the end of the ceasefire to ease restrictions on Palestinian access to the border region near the "security buffer zone." A number of recent demonstrations in the occupied territories have marked Land Day, commemorating a general strike and marches that took place on Mar. 30, 1976 to protest Israeli land seizures. Six unarmed Palestinians were killed and hundreds injured by Israeli forces that day. 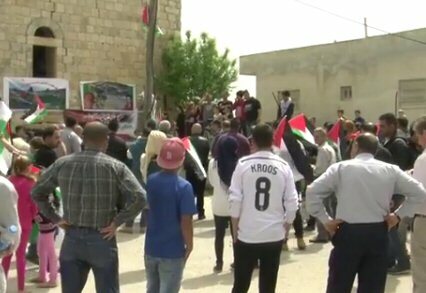 On the 27th of March 2015, close to 200 protesters from all over the West Bank gathered in Nabi Saleh to protest the occupation in commemoration of Land Day. The protest was met with extreme violence as the Army and Border Police fired large amounts of tear gas and rubber coated steel bullets as well as several rounds of M16 live ammunition at the protesters. On March 30th 1976 a general strike and marches were arranged all over Palestinian cities within Israel from the Naqab to the Galilee. The actions were a response to the Israeli Government’s expropriation of thousands of dunas of Palestinian land. During the actions six unarmed Palestinian Israeli citizens were killed, 100 wounded and hundreds more arrested. It was the first time since 1948 that the Palestinians within 1948 Israel organized as a Palestinian national collective and the date is commemorated yearly with a series of protest all over the West Bank. 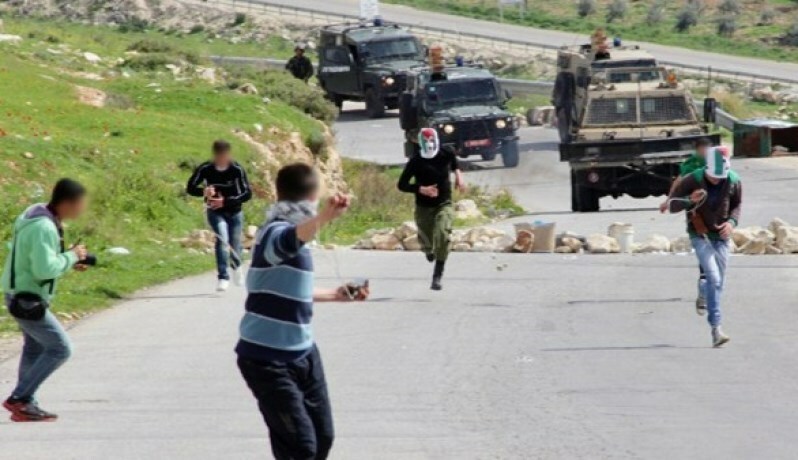 This year the protests began on Saturday the 28th of March in Nabi Saleh. Around 12 pm on Saturday, protesters from all over the West Bank, from Hebron to Kafr Qaddum, gathered in the village of Nabi Saleh. The demonstration was a local protest in commemoration of Land Day and of the two villagers Mustafa Tamimi and Rushdi Tamimi, who were murdered by the Israeli occupation soldiers. After midday prayer protesters made their way down the main road of the village chanting and singing. On the outskirts of the village nine army and border police jeeps was gathered and as the demonstraters approached the road the about 60 soldiers and police rained tear gas on the unarmed and unoffending protesters. Several people suffered from severe tear gas poisoning as the military pushed them back into the village overpowering and arresting one Palestinian activist. The tear gas clouds covered the street for more than 30 meters and the protest spread into the farmlands surrounding the village. As the protest continued in the hills around Nabi Saleh protesters gathered again and threw back a large number of the tear gas canisters still being rained down on them by the army and border police. Resisting the tear gas and throwing the canisters back towards the military themselves the protesters managed to push the soldiers and police back down the hills towards the village gate. Here they took cover behind their jeeps unable to despurse the demonstration. As the protest continued the soldiers began firing rubber coated steel bullets at the protesters who took cover behind stones and trees as the bullets jumped off the road between them. The steel bullets came repeatedly and several protesters were hit and carried from the scene. As the protesters ducked from the rubber coated steel bullets the sound of M16’s began to fill the air as soldiers started to target Palestinian protesters, children, internationals and journalists on the Hill with live ammunition. Fifteen M16 bullets ricocheted of the stones on the ground very close to the protesters, fortunately not hitting anyone. However, the protest continued for half an our longer until the military got back in their jeeps and moved back towards the check point at the outskirts of the city. The Land Day protests will continue all over the West Bank throughout the week. Israeli occupation forces (IOF) fired teargas canisters and stun grenades at Palestinian protestors in front of Ofer military roadblock near Ramallah on Sunday. 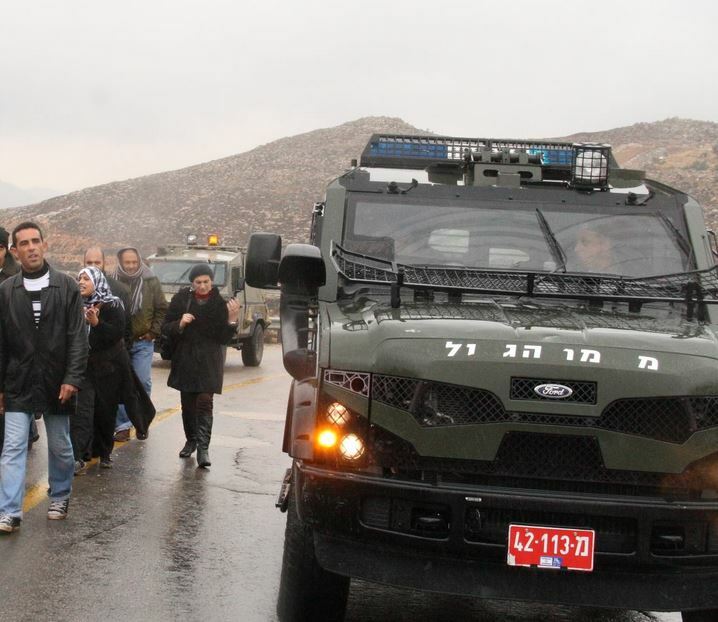 Eyewitnesses said that the protest was organized by the committee against settlement and the wall in the West Bank demanding the release of its acting chairman Jamil al-Bargouthi, who was arrested on Saturday while participating in an anti-settlement march in Nabi Saleh village. They said that many citizens suffered breathing problems as a result of the extensive use of the teargas bombs. Sources in the committee, meanwhile, said that the Israeli occupation authorities offered Barghouthi his freedom in return for a five thousand shekels bail and a pledge not to participate again in anti-settlement activities. The Israeli occupation forces (IOF) on Saturday apprehended Jamil al-Barghouti, head of the West Bank committee against the wall and settlement. The IOF captured activist al-Barghouti as he partook in a peaceful demo commemorating the Land Day and the fifth anniversary of the launch of popular resistance in Ramallah’s town of al-Nabi Saleh. According to Basem al-Tamimi, a popular resistance leader, the IOF troops brutally attacked the peaceful march in the town in an attempt to disband the rally-goers, moments before they kidnapped al-Barghouti and dragged him to an unidentified destination. The captive was most probably transferred to the Ramallah-based Palestinian liaison office, the activist further stated. He said the IOF soldiers targeted the non-violent protesters with randomly-shot spates of rubber bullets and tear gas canisters. 10 Palestinian civilians sustained rubber bullet injuries and others choked on tear gas in the process. Mayor of Ramallah and al-Bireh, Mrs. Layla Ghannam, meanwhile, managed to join the rally staged in al-Nabi Saleh village after she was detained, along with the members of her accompanying crew, at the main entrance to the village for several hours. 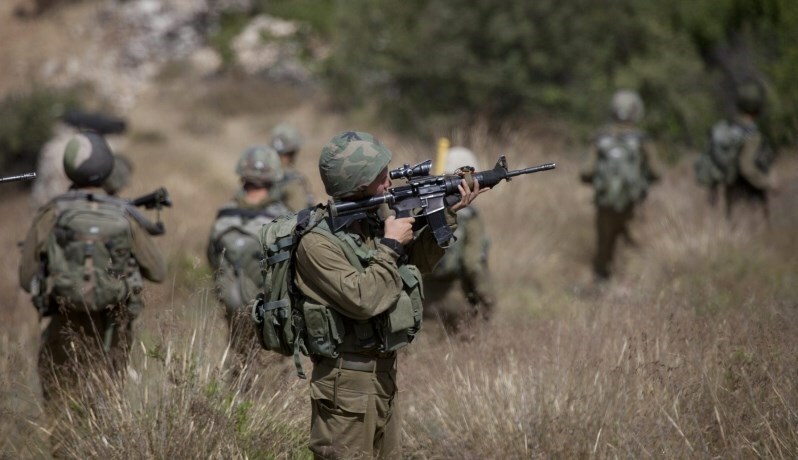 Israeli forces conducted military training exercises in the Ramallah district town of Birzeit earlier this week, according to Israeli media. The Israeli forces' Territorial Brigade allegedly raided the town, which is just outside the central West Bank city of Ramallah, in what was reported by Israeli news source Haaretz as "preparation for a possible escalation on the ground." The forces engaged in a variety of potential scenarios including confronting violent mass demonstrations, shooting attacks, and use of live fire by members of Palestinian security forces. While Haaretz reported the exercise was planned with the intention to cause "relatively little disruption to the routine of Palestinian life," the account included a training exercise that involved a raid on the home of a Birzeit University college student, whose house was searched during the night while he stood in his pajamas with an Israeli soldier. The training exercises come just over a year after Israeli forces shot dead a 24-year old Palestinian in the same town during a raid. Muatazz Washaha was killed after Israeli forces tried to invade his home and arrest him for being part of a leftist political group in Feb. 2014. The forces fired a shell into the home following a brief stand off. An Israeli army spokeswoman did not have any immediate information about the training, but told Ma'an she would look into recent military training activity in the area. Birzeit is in Area A, falling under full civil and military control of the Palestinian Authority according to the Oslo Accords. However, Israeli forces repeatedly enter Area A, most often in military raids launched on a near nightly basis to detain Palestinians. Israeli human rights organization Yesh Din reported that Israeli forces have upheld the practice of using populated Palestinian areas for Israeli military drills since at least 2007. The group filed a complaint against the Israeli Military Advocate General's Corps in 2013, arguing that such military exercises "sow fear and panic and violate the security and dignity of the residents," particularly because exercises are often not announced to Palestinian locals in advance, and thus it is not always clear to nearby residents that these are mere drills. The military's Legal Advisor for the West Bank declared in February 2014 that military training exercises were no longer authorized to be held in Palestinian villages without giving prior notification to the civilian population. However, Yesh Din has criticized the fact that the practice has continued. Anas Qdeh, 21, had no idea that waving the Palestinian flag and flashing the V sign is a crime for which he will be shot by the Israeli Occupation forces (IOF) which fired explosive bullets directly at his legs while he was with scores of citizens about 10 meters away from the security fence separating Khan Younis from 1948 occupied lands. Qdeh told the PIC reporter: "On Friday March 20, I headed to our land east of al-Sanati in Greater Abasan where many youths gather every Friday to stress that this is our land and that we will never give up on it even if Israel isolated it. The IOF imposed a buffer zone adjacent to the security fence along the borderline with the Gaza Strip stretching for distances ranging from 300-700 meters deep into the Strip and shoots whoever enters it. 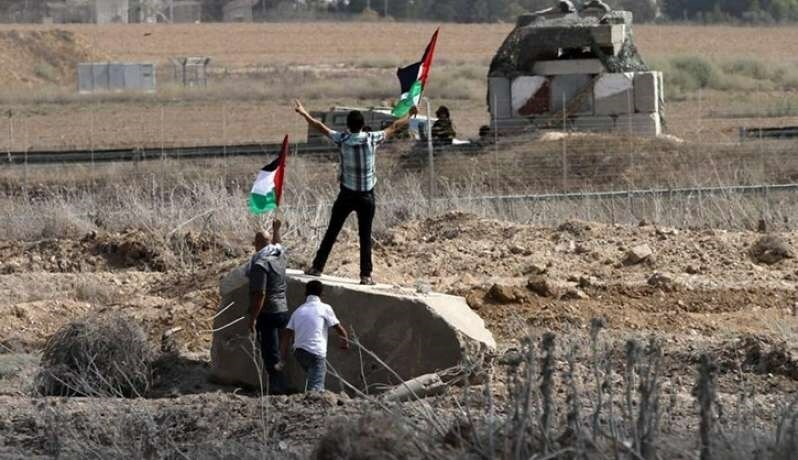 Qdeh clarified the circumstances of his injury saying: "One of my friends wanted to take a picture of me waving the Palestinian flag with the V sign while we were in our land which the IOF is preventing us from reaching in Greater Abasan east of Khan Younis. However, the IOF soldiers started shooting at us and I was hit with an explosive bullet." The bullet hit one of the youth's legs, and the shrapnel scattered to hit his other leg and his cousin Fawzi Qdeh who was nearby. Anas lied on the ground profusely bleeding before he was rushed to hospital to be urgently treated. His cousin Fawzi Qdeh, 23, said with a smile drawn on his face that a piece of shrapnel is still lodged in his left shoulder and doctors told him that it is difficult to extract it at this stage. He clarified that he was rearing his goats in al-Santai lush fields, and when he saw the youths gathering and chanting he joined them to see what was going on and to take photos. Every Friday, scores of Palestinians spontaneously gather near the security fence waving flags and chanting anti-Israel slogans. The Israeli Army Saturday opened machine gunfire and launched a missile toward Palestinian agricultural land along the eastern Gaza borders, according to WAFA correspondence. A loud explosion and the sound of numerous shots were heard to the east of Al Shuja'eyya neighborhood, spreading a state of fear and panic among residents and their children, particularly school students nearby the area. Israeli soldiers stationed at watch towers along the borders, to the east of Gaza city, fired of a missile and opened a hail of gunfire toward Palestinians' agricultural land, causing damages and financial losses to properties. Israel has unanimously declared large swathes of land along the Gaza border a buffer zone, which extends between 300 and 500 meters from the border with Israel. The Israeli army and border police have repeatedly opened fire through the border despite an Egyptian brokered ceasefire agreement reached on 26 Aug 2014. which was supposed to put an end to hostilities between Israel and Palestinian factions. According to the UN Office for the Coordination of Humanitarian Affairs (OCHA), 17 percent of Gaza's total land area and 35 percent of its agricultural land were within the buffer zone as of 2010, directly affecting the lives and livelihoods of more than 100,000 Palestinians in Gaza. 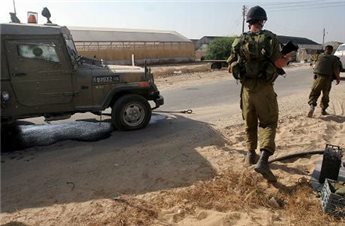 Israeli Occupation Forces (IOF) opened machinegun fire at Palestinian farmers to the east of Gaza on Saturday morning. 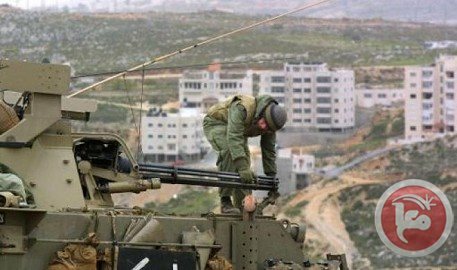 A Palestinian field monitor said the IOF soldiers stationed in military bases and vehicles to the east of Zeitoun neighborhood in southeast Gaza City opened machinegun fire at Palestinian farmers and houses in that border area. The shooting coincided with unusual moves of the IOF within the borderline in addition to intensive flying of surveillance drones. No casualties were reported. Israeli occupation forces (IOF) raided Beit Furik village, to the east of Nablus, and broke into dozens of houses at dawn Saturday. 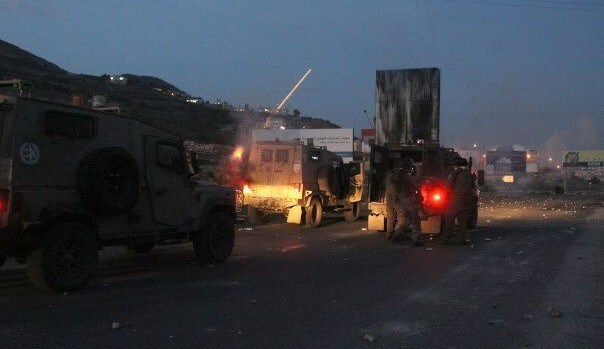 Eyewitnesses told the PIC reporter that IOF troops in a number of army jeeps stormed the town before dawn and headed to its eastern outskirts. They said that the soldiers forced their way into dozens of homes on the main road and along the street leading to Nakara alley, adding that the soldiers searched the houses and questioned their inhabitants. Palestinian medical sources have reported, on Friday evening, that three Palestinians suffered the effects of tear gas inhalation after Israeli soldiers fired gas bombs, and live rounds, targeting farmers in Palestinian lands, east of Rafah and Khan Younis, in the southern part of the Gaza Strip. The sources said the soldiers, stationed on military towers across the border fence with Gaza, targeted farmers and residents near ‘Abasan and Khuza’a towns, east of Khan Younis. Three Palestinians suffered the effects of tear gas inhalation, and received treatment by local medics. 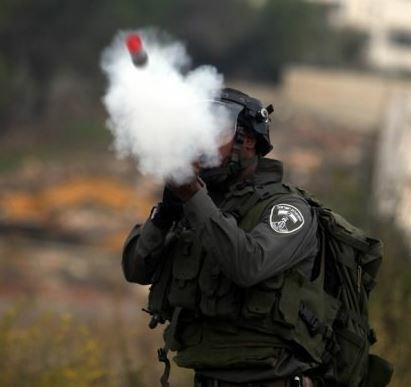 The soldiers also fired gas bombs on villagers east of Rafah, in the southern part of the Gaza Strip. In addition, Israeli military war jets extensively flew over different parts of the Gaza Strip, while Israeli navy ships opened fire on Palestinian fishing boats in Gaza waters; no injuries were reported. Medical sources have reported that two Palestinians and two international peace activists have been injured, and many suffered the effects of tear gas inhalation, after Israeli soldiers assaulted the weekly nonviolent protest against the Israeli Annexation Wall and Settlements, in Bil’in village, near the central West Bank city of Ramallah. Today’s protest also came in commemoration of the Palestinian Land Day, marked by the Palestinians every year on March 30. The Popular Committee against the Wall and Settlements in Bil’in said the soldiers fired rubber-coated metal bullets, gas bombs and concussion grenades on the protesters who peacefully marched towards the Wall. The soldiers also chased the nonviolent protesters into the village’s streets and alleys, before detaining a child, identified as Mahmoud Khaled Abu Rahma, 12 years of age. The army took the child out of the village, and released him after the weekly protest was concluded. The Popular Committee said its coordinator Dr. Rateb Abu Rahma, 50 years of age, was shot by a rubber-coated metal bullet in his back, while Ismael Mohammad Abu Rahma, 18, was shot in the leg. It added that an international peace activist who was shot by a rubber-coated metal bullet in the leg, was moved to the Palestine medical center, while a 78-year-old international supporter was also shot in the leg. Scores of Palestinians, Israeli and international peace activists suffered the effects of tear gas inhalation as the soldiers showered them with gas bombs. The Popular Committee said the protesters marched carrying Palestinian flags, and chanted for national unity and the liberation of Palestine, in addition to calling for ongoing resistance against the Israeli occupation, and the release of all detainees. Today’s protest also came to mark the 39th anniversary of the Palestinian Land Day of 1976, and called on all Palestinian people in every part of Palestine to unite, and to continue their popular nonviolent resistance against the illegal Israeli occupation and its colonialist policies. The Palestinian Land Day, (March 30), marks the day when Israel in 1976 illegally confiscated thousands of Dunams of Palestinian lands, mainly privately-owned, leading to ongoing protests and general strikes in various areas, from the Galilee to the Negev, extending to every part of occupied Palestine, while the army also shot and killed six Palestinians, in addition to wounding and kidnapping hundreds of residents. The day became a historic event in every part of occupied Palestine, protesting Israel’s illegal apartheid policies, and crimes, against the Palestinian people, since its establishment in the historic land of Palestine in 1948 after destroying and depopulating hundreds of villages and towns. Israeli soldiers used excessive force against nonviolent protesters conducting the weekly protest against the Israeli Annexation Wall and Settlements in Ni’lin village, northwest of the central West Bank city of Ramallah. 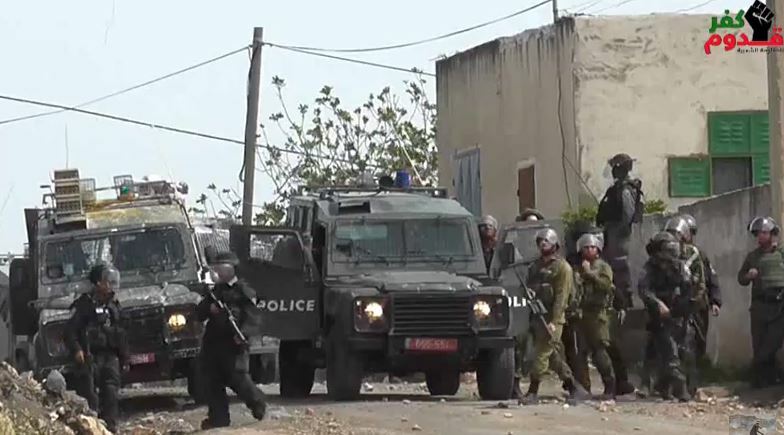 The soldiers attacked the nonviolent protesters as they were marching towards the Wall, surrounding their orchards, in the southeastern part of the village. Mohammad ‘Amira, member of the Popular Committee against the Wall and Settlements in Ni’lin, said the soldiers violently assaulted Palestinian and international peace activists, and fired rounds of live ammunition in addition to gas bombs and concussion grenades. Ni’lin and nearby Bil’in villages, are among many Palestinian villages that conduct weekly nonviolent protests against Israel’s Annexation Wall and its illegal settlements in the occupied West Bank, and occupied Jerusalem. 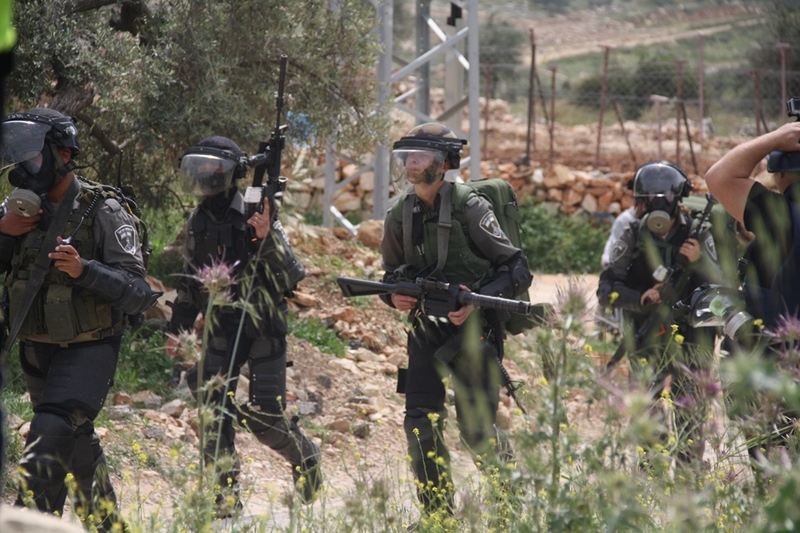 The village is subject to frequent Israeli military invasions, assaults and arrests. Dozens of Israeli soldiers invaded, Friday, the village of Kufur Qaddoum near the northern West Bank city of Qalqilia, and attacked its weekly nonviolent protest against the Wall and settlements, leading to clashes; at least five Palestinians injured. The Popular Committee against the Wall and Settlements in the village said the soldiers closed main roads, fired dozens of gas bombs, concussion grenades, rubber-coated metal bullets, and live ammunition. Clashes erupted between the invading soldiers and scores of local youths in the village that was covered with smoke resulting from gas bombs fired by the soldiers. 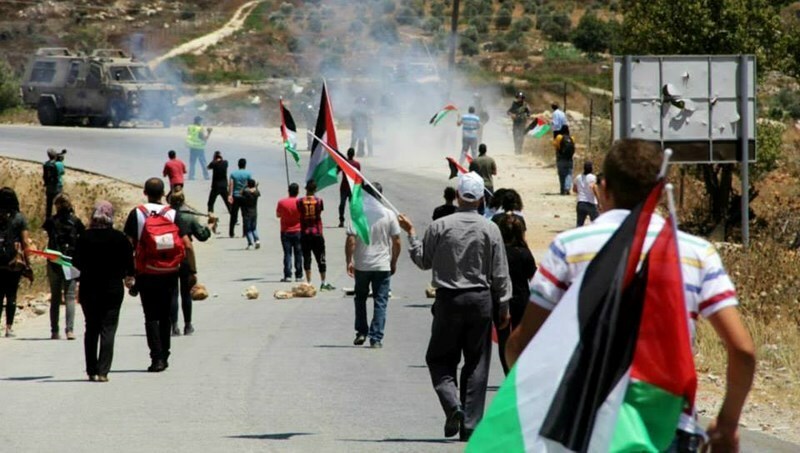 Coordinator of the Popular Committee against the Wall and Settlements in Kufur Qaddoum Murad Shteiwy said the soldiers used excessive force against the weekly protest that is also held demanding Israeli to reopen the village’s main road that the army sealed 13 years ago. He added that the soldiers invaded the village from three directions while firing dozens of gas bombs and live rounds. Residents Nasser Barham, 42, Hakam Khaldoun, 24, were shot by rubber-coated metal bullets in the abdomen, while resident Mohammad Abdul-Salam, 18, was shot by a rubber-coated metal bullet in the head, and Maher Jom’a was shot in the leg. In addition, an Israeli military bulldozer destroyed the main water pipe leading to the village, causing the villagers to be without running water for a few hours before local maintenance teams managed to fix it.